So here it is, in all its honesty. So over the last few years I've taken on exercise challenges, mostly in an attempt to control the lbs! Having 4 beautiful best friends, I always felt I was the chubby one in the group, and being insecure about that made me eat and drink my insecurities away! A viscous cycle for many, you eat because you feel low, you feel low because you eat, I know I'm not the only one to deal with this problem! I got to the point that I was bored of feeling terrible and upset all the time and my best friend was getting married in Cyprus and I didn't want the memory of her day to be shadowed in my mind with negative thought of how I'd looked in a bridesmaid dress. So I thought I'd try and do something about it. So the first goal was Bristol 10k, and starting without being able to run to the end of the road, this felt like a massive challenge for me! But I did it, and having raised money for charity in the process felt great! That's where it started, and the next goal for me was a half marathon. I enjoyed running, an hour of Zona time, just me and headphones allowed me to forget the world and be in control. And that's what it was about for me, focusing and controlling my input into each challenge. 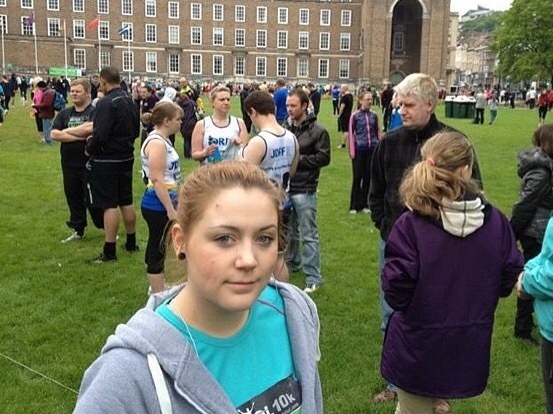 The half was great, I'd trained and had a time in mind, and my friends and family came to support me in Bath and I ran it, without any problems, and I raised money for the hospice that had looked after my Grandma in her last few years. There were tears at this point, I'd never done anything for myself before, I mean really setting a goal and sticking to it. And I was hooked! I felt so proud and the bug grew bigger! Then I set my September challenge (100 mile bike ride with my friend Dawn in memory of her nephew, followed by half marathon, followed by another 100 mile bike - each Sunday throughout September). I was super proud, working out 4-5times a week, sometimes for 4 hours at a time, I had this bug that only exercise could feed! The control and focus on something other than work allowed me to enjoy something other than my job and I'd never had that. Being creative is my whole life and I'd never felt passionate about any other kind of hobby. The challenges fed the adrenaline and gave me more to work for. The September challenges were hard, the first ride, the one with Dawn, hadn't gone exactly to plan when Dawn had got injured, but I wasn't going to let her down and ended up riding the last 25miles alone. It was hard, we had set the plan together and the rug was whipped out from under our feet. But there was no way I wasn't going to finish. Then the next week, I ran the half marathon, it was hard, I hadn't really been running as I'd been focusing on my cycling but I managed it, a little slower than I'd have like (2:38) but it was fine, I'd finished and that's what mattered. Then the next week I had the blaise cycle, and thankfully I had Kev, my friend and trainer, there with the whole way! I'd hit a wall at 60 miles, I hadn't wanted to carry on but he wouldn't let me quit. He wasn't allowing it after I'd come so far so he cycled and motivated me for the next 40 miles and at the end, I'd accomplished the biggest thing I'd set my mind too! But then I HIT THE WALL! I fell out of love with working out, I didn't want to anymore, it felt like a chore that had taken over my life. I didn't know how to just curb it back and just work out for a hour at a time, that felt like I wasn't working out. But I didn't want to set hours aside for it anymore! Friends tried to keep me motivated, but the more people pushed, the more I pushed away. I stopped training with my trainer and stopped self motivating, I started evenings of tv watching and working all the hours under the sun, to distract myself from the issue! And here we are. I've flittered for about a year and a half, doing home workouts and little gym sessions to curb the guilt, but in honesty my heart hasn't been in it. I've struggled to feel committed to it and hoped that over time I'd just be able to be one of those lucky girls who doesn't have to work out... but that's not me! I've seen my body change, and take a step backwards and it doesn't make me happy! People don't notice as I've not nessecerely put on size (I have a little bit not a huge amount) but I've changed shape, I'm less toned and a lot less fit! But here it is, my new start begins tomorrow, I've set a beginner training plan, a food log, and have friends on board to help motivate me. And I'm doing it again, I've set a goal! Next summer I'm cycling Lands End to John O'Groats. I know it seems like a mega challenge (I know it is and I'm scared about it!) but if I learned anything over the last few years; it's that! That's how it works for me! Go all in, or don't bother at all! So I've set the challenge and the charity; I'm raising for Cancer Research Uk in memory of my grandfather, and knowing that people are relying on me - they've paid their donations - is what will keep me focused! Well, that's it! The Summer Series is complete! I've had a blast illustrating my month and looking back at the things I've been up too! I'm going to set a new challenge for October, so keep an eye out for that new project! Thanks for coming along of my Summer Series journey! Today not a lot has happened, but one thing that has made my day, was that a few people complimented me on my dress, which is blue and covered in cherries! Today is going to be a productive Sunday, and i'm going to get through my To-do List! It's a must! So today I'm seeing the bestie, whilst she is back from America for a few days! I'm sure there will lots of laughter and drinks! After work I met Jess and Dave for a coffee and a catch and Jess had wicked silver hair! Super jealous, looks wicked Jess! Tonight I was invited to the Strange Bristol Launch, a collaborative collection of beautiful pieces, selected by married couple Gavin and Jane Strange. I honestly couldn't be more in awe of them, it was a beautiful collection; from pins, cushions and tea towels to beautifully hand crafted jewellery, leather bags and even a chair made of wool! It's an amazing collection and I have no doubt you'll want to put your hand in your pocket and take something home! If you get a chance, head down to Christmas Steps in Bristol over the weekend and grab yourself something special! I promise you that you won't be disappointed! So with an unexpected day off today, I thought I'd take the opportunity to sort through the receipts box! Another thing off the To-Do list. Feeling so much more organised after a few weeks of de-cluttering and re-organising! So today I'm feeling excited because I've had that i'm fundraising for Cancer Research Uk has been accepted and they are going to send me some t-shirts out for me to wear on my ride! So started off Monday the right way and made sure I went to the gym with Sophie, was really hard work and thankfully I have her to push me! She's so much stronger than I am, so its nice to be pushed and she motivates me to be positive and have a 'can do' attitude in the gym! Gym buddies for life I think! Today will be fuelled by coffee... an afternoon of work whilst my partner watches the Moto GP. Chores all done, so just to get through some of the work to do list! After a crazy few months socially and working too much, I've been feeling really overwhelmed and this week more so than normal! So I've decided to turn off social media for the weekend, and get productive! Today is going to be spent, deep cleaning the flat and re-organising everything so I can feel like things aren't so out of control! I know this is a dorky way to spend my weekend, however a tidy home makes me feel so much more relaxed! Then this afternoon will be spent working! Having yesterday off means I have some client emails and accounts to catch up with! I know tomorrow evening, I will be able to sit and feel so much better! So today I'm not at work. We are heading to Devon to say goodbye to dear friend of my dads. Dad doesn't talk much about his time in the army, but I've heard many stories about Roo and the impression he made on my dad is evident. My dad doesn't really look up to people, but Roo obviously made a massive impression on his life, so much so that i'm named after him! Early last year, after many years of lost contact, my dad and I set out to find Roo. He doesn't have social media profiles and lived a pretty secluded life. We contacted Army Forums, wrote to email addresses and physical addresses, to no prevail. Then early this year, we hit the jackpot! We had 2 messages, one from Colin and one from Helen, saying they were still in contact with Roo and that they would pass our details on for us! Then, one evening out of the blue, I had a call. I don't normally answer numbers I don't know, but this evening, something told me to. It was Roo! We spoke for about an hour, about times my dad had with him in the army, what I did for a job, about his family and what they did and we agreed that when he got back from Australia, we would sort out a time to meet. I was estatic, after all the time searching, I'd finally get to meet him. Unfortunately that day never came, and last Thursday I had a message from Colin, to say that Roo had unexpectedly passed away. Tears filled my eyes, I had a knot in my throat and was awash with sadness. So today we go to say goodbye and show our respects, to a man that made a great impression on the people he met, and the one he didn't! RIP Roo, until we meet on the other side! Today's illustration reflects my new purchase! I've brought myself a new notebook to be a bullet journal. I have forever been trying to organise myself and currently am failing miserably, so I've brought a new notepad that will become my bible for life! I will track my daily and weekly routines and hopefully this will help me plan ahead a little more than I'm currently am able too! I'm going to get it all organised and sat on september 1st! This will be my continuation of this summer series, where I'm tracking things daily now! So after a busy day of work, I cycled home, then met up with a few girlfriends to sort out our best friends hen party. I obviously can't spill the beans about what's been planned... but here is a little hint! So everyone tells me, I work to much and that I never let myself have down time... well tonight, I have! I have sat down and watched trash tv, whilst drinking tea and colouring in (no i'm not a child, its one of those adult colouring in books :P ) and just relaxed... its not often that I completely shut off for an evening, so was really nice to just relax and not think about work! All my friends went to the beach today, whilst I had to stay behind and work (the joys of freelancer life) so the sun, sea and sand have been on my mind all day! Today I took my niece to see The BFG, it was beautiful! I loved how they'd visualised the dreams, magical! Today we have a friends 30th birthday party... i'm sure there will lots of cake and LOADS of shots!